Trish felt they'd been waiting too long for the elevator, and there were now so many people waiting that the ride would be crowded. She turned to George. "Stairs?" He nodded and off they went. 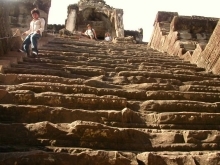 Ancient stairs at ruins in Cambodia. In the empty stairwell, walking down the three floors to the coffee shop, George asked, "What do you think he meant by 'I hope everyone gets their projections in on time.'?" "Probably Marigold was late again," Trish answered. "Or maybe Diamond. Somebody." George grew concerned. "Yeah, there'll be real trouble for anybody who's late this time. How does it look for us?" "Not good," Trish said. She stopped on the landing. "We'll have to rearrange things if we want to avoid trouble." George and Trish are reordering priorities to avoid a problem that might exist, if they're parsing their director's words correctly. Maybe they're right, but their conclusion is based on their guess that the director is communicating indirectly, and that the real message is cloaked in innocent-sounding language. cause delaysThis kind of possibly unnecessary adjustment adds delays to our projects, costs to our operations, suspicion to the atmosphere, conflict to our relationships and stress to our lives. Indirectness can often be a tool in destructive conflict, and it can be dangerous even when its user means well. Here are some of the ways indirect communication can cause problems that increase costs and time to market. To make messages indirect, we often disguise them. For instance, we might want to say, "Jim, if your report is late again this week, we might lose funding for this project." To avoid confrontation, we might instead say, "I hope everyone gets their reports in on time." When we think we're receiving an indirect message, we often need additional information to be certain of the real message. When we receive ambiguous or incomplete information, we tend to make up what we don't know. By compelling people to guess, we enhance the risk that people might choose incorrect interpretations. Because of the ambiguity of indirectness, recipients have choices. They might ignore a message thinking it wasn't intended for them; or they might miss it altogether; or they might interpret it in novel ways. All of these possibilities can increase costs through rework, unnecessary work, confusion, more and longer meetings, increased interpersonal and organizational conflict and delay. Once a pattern of indirectness is established, people expect ambiguity. They search for multiple meanings because they don't want to be surprised. And when they search, they find. This leads to what some call "over-interpretation" or "reading too much into it." Once people find alternate interpretations, they raise questions to resolve their confusion. And senders tend to view these questions with suspicion, which leads them to ever-increasing indirectness. Would you like to see your comments posted here? rbrensAKciMxIoSqocyMkner@ChacwdtOdkmfOlqdMGIvoCanyon.comSend me your comments by email, or by Web form. See also Personal, Team, and Organizational Effectiveness, Effective Communication at Work and Conflict Management for more related articles. I offer email and telephone coaching at both corporate and individual rates. Contact Rick for details at rbrenWNsEVAOHljaedueRner@ChacYBdbFkPLMOyoXuRfoCanyon.com or (650) 787-6475, or toll-free in the continental US at (866) 378-5470.